Sep 16 Mini-Mindfulness Challenge: Drink Up! Welcome to Week 3 of the Mini-Mindfulness Challenge. I'm so glad you're here! The mindfulness focus this week is water, a prompt I personally need! The recommendation for daily water intake varies from 8 to 12 cups. It would be smart to get a minimum of 8 cups per days. Beware of coffee, milk, juice, and alcohol, which can all contribute to dehydration. Mini-Mindfulness Challenge - Week 3: Drink Up! Each time you drink water, let it signal you to come back to the present moment. Notice how the water feels as it glides down your throat. It might feel wet, thirst-quenching, or filling. Notice any sensation that occurs without generating new thoughts about it. Just notice. If you wish, you can also keep track of the number of glasses of water you drink each day. As you drink up this week, remember mindfulness is not over-concentration. Mindfulness doesn't mean being laser-focused on the task at hand to the exclusion of everything else within and around you. Instead, just be lightly aware of your object (drinking water in this case). You'll still be cognizant of sights, sounds, mental impressions, and other stimuli as well. But your main attention will be on the sensation of drinking water. Practice the prompt for a full week if possible. If not, try it out for 4-5 days. Or, alternate the prompts we've worked with so far - smile, worry, water - using a different one each day. Go at your own pace. You don't have to be aware every time you take a sip. If you forget, that’s okay. Forgetting is a normal part of the process of learning to be mindful. Just start again as soon as you remember. Never reprimand yourself for forgetting. Be gentle and encouraging instead. Don’t get stressed! Approach the exercise with playful curiosity. Each day celebrate your accomplishment to reinforce it. Even if you drank one glass of water mindfully that day, it's a good start. Keep track of your experience in a journal if you would like, but don't obsess about getting it "right." Return here the next Wednesday to receive a new prompt and share your experience with us. Write “water” on a post it-note, and place it in a prominent place where you'll see it often. Set a timer on your watch, computer, or SMART phone to beep once an hour (or however often you like) as a reminder. Briefly reflect on the benefits of drinking water each day to inspire your motivation. Taking the time to consciously drink a glass of water can help you relax, reconnect with your body, and feel grateful for this life-enhancing elixir that's so easily available to you. In these small ways, mindfulness helps you experience the richness of every moment. If you would like to know more about what mindfulness is and what it is not, please read my article: You Can Beat Stress With Mindfulness. 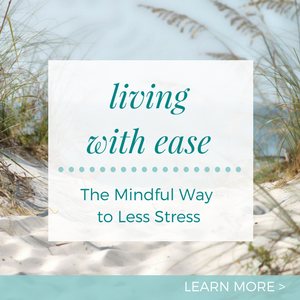 How did Week 2 of the Mini-Mindfulness Challenge: Dispel Worry go for you? Was it too challenging or just what you needed. I would love to hear. And what do you think about drinking water as a prompt? Wishing you a good week with more smiles, less worry, and plenty of water! And here's Week 1 and 2 if you haven't seen them yet.